The EU indices eroded again this month with the EMU aggregate index edging lower to 106.1 in February from 106.3 in January. 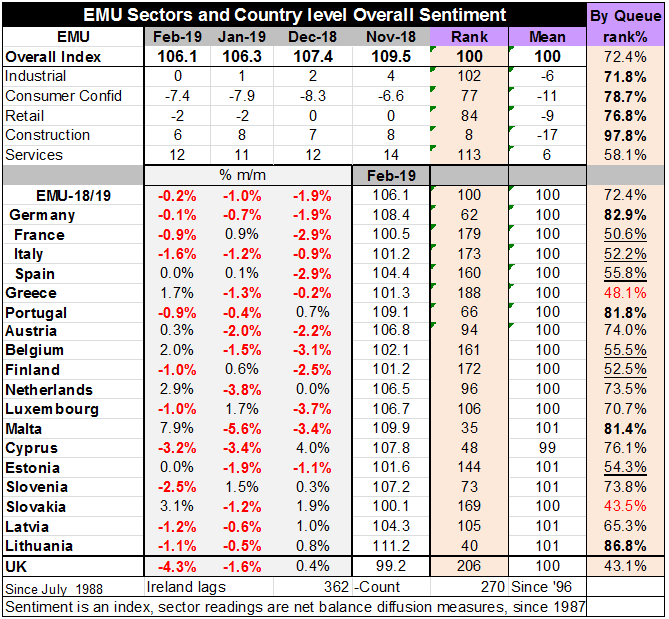 The overall EMU sentiment gauge sits at the 72nd percentile of its historic queue of data. As for the sector and specific indices the industrial gauge is weaker in February dropping by one point to a net reading of zero. The construction metric falls to a net value of 6 in February from 8 in January. Rising in the month was the services metric which rose one point to stand at a net reading of 12 in February. Consumer Confidence advanced to a less negative value at -7.4 in February from a value of -7.9 in January. The retailing reading was unchanged month-to-month. The various specific and sector readings show rank standings in their respective 70th percentiles for the industrial sector, consumer confidence, and retailing. Construction has a higher bar with a 97.8 percentile standing. The service sector is much weaker and moderate with a reading at its 58th percentile. Looking at country-level results 10 of 18 early reporting EMU members show an overall sentiment gauge that has dropped month-to-month. This indicates that weakness is still broad-based. EMU as a whole, Germany and Italy all show three-monthly declines in a row. No country in the table has three increases in a row. The UK as a non EMU member in the table shows a 4.3% drop February after a drop of 1.6% in January. It continues to struggle to form a coherent policy toward Brexit. Looking at the standings of the country level readings we find no countries in the top ten percentile of their historic queue with four in their 80th percentile decile - and only one of those four in the upper part of the 80th decile. There are an additional five countries in the 70th percentile decile - most of those are below its mid-range level (below 75%). But only two countries have readings below their historic medians these are Slovakia and Greece. There are six members with standings in their respective 50th percentile decile and most of those are below their mid-range values as well. As a separate case the UK has a 43 percentile standing. The country level and sector data are weak or slowing and speck of a great deal of moderation in EMU. The sector data seem to show a bit more of a transition to stability that the country level data do not agree with. At the country level the bulk of member countries are still showing declines in their overall sentiment gauges.